By the time that Eugenio Montale (1896-1981) received the Nobel Prize in 1976, the world was beginning to acknowledge that he was among the greatest of the modernist poets, author of a poetic canon that spanned much of the twentieth century. 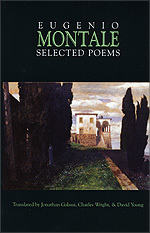 Profoundly rooted in the Italian landscape and culture and with an enormous sensitivity to his language and its heritage, Montale shaped poems throughout his life that were mysterious, resonant, and layered with meanings. His poems range from daily life through history and myth, and on to questions of metaphysics and divinity. As a love poet, a landscape poet, and a spiritual pilgrim, he has few equals. This volume, which draws on the entire corpus of Montale's work, brings together three of his most experienced and effective translators. to the young shrubs it grazes. that form in the brimming wellspring. the needle's eye, but most do not . . . Translation copyright c 2004 by David Young. May not be reproduced without permission.